Enjoy the security, dependability and convenience of home banking. Now you can manage your CCCU accounts online from home or office. 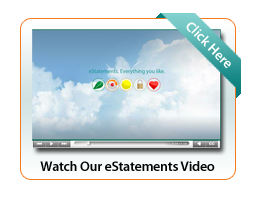 Enjoy the safety and convenience of electronic bank statements with CCCU's Live View eStatements. Live View eStatements Offer Many Benefits! Access past statements anytime - Statements are archived so you can easily view and print past statements anytime with no fee. eStatements enrollment can be done through our online banking! Q. How do I sign up to receive eStatements? A. Log in to online banking and sign up under 'Services'. Q. How will I be notified when my eStatement is available? A. You will receive an e-mail message that your statement is ready to view or print online. Q. What are the benefits of eStatements? Q. Will I still receive a paper statement? A. No, you will no longer receive your month end statement by mail. Q. If I’m receiving eStatements and forget to notify the Credit Union that my e-mail address has changed what will happen to my statement? A. eStatements will discontinue and you will receive paper statements via mail the next statement cycle. Q. If I don’t like eStatements how do I change back to paper statements? A. You can notify the Credit Union and we will convert you back to paper statements. Q. Will I have the ability to save or print my eStatement if needed? A. Yes, you can save or print your eStatement. Q. What requirements are needed in order to receive eStatements? Q. How do I notify the Credit Union when my e-mail address changes? A. Complete the eStatement Change Form. Q. How do I change my personal identification number (PIN) for eStatements? Q. How long does it take to process change requests? A. Your request will be completed in 24 to 48 hours excluding weekends or holidays.